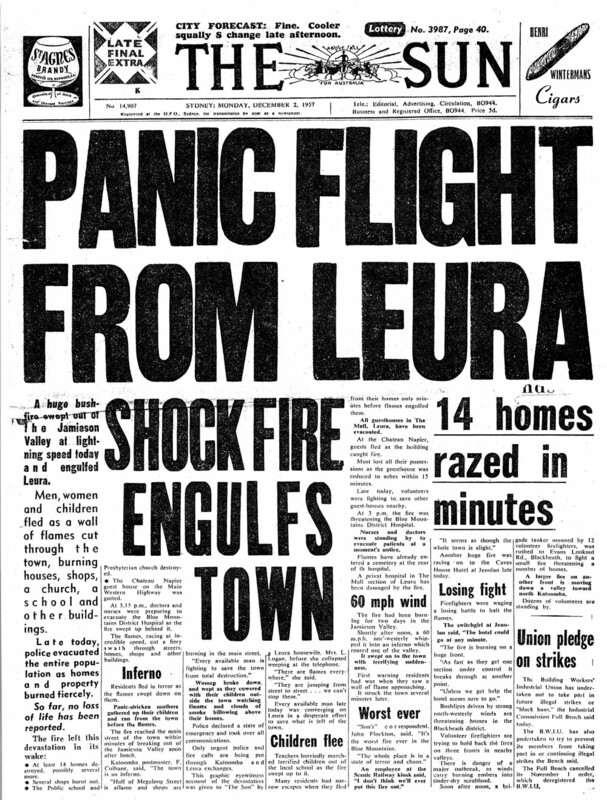 Fires like the one that destroyed Leura eventually led to the formation of the NSW Rural Fire Service. 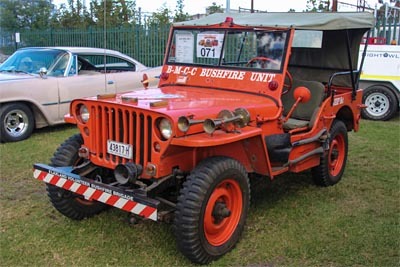 This CJ-3B labelled as "BMCC Bush Fire Vehicle" was operated by the Blue Mountains City Council prior to the formation of the RFS. 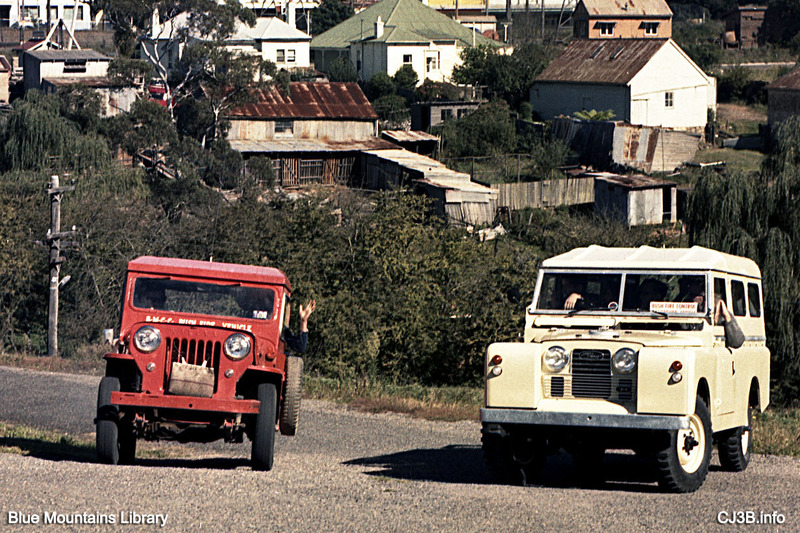 This slide taken in Katoomba (a mile west of Leura) in 1972 shows the Jeep with a Land Rover also carrying a sign saying "Bush Fire Control." 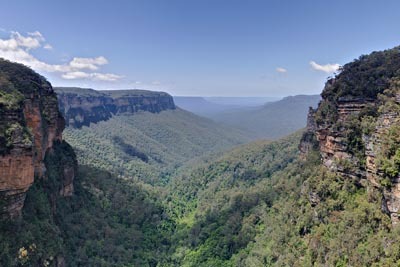 See the full photo (600K JPEG) courtesy of the Blue Mountains Library. I would like to find more details or photos of this Jeep. The right-hand-drive Jeep has a canvas water bag on the front, to keep drinking water cool by evaporation -- thanks to David Mercer for identifying that. It's difficult to see whether the Jeep is carrying any firefighting equipment. 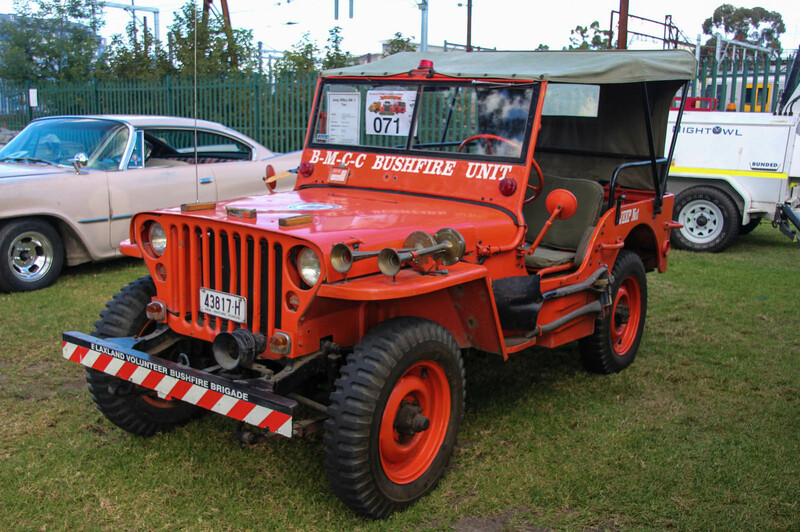 An earlier jeep used in the area was this 1943 Willys MB, used briefly by the Blaxland Volunteer Bushfire Brigade, established in the 1950s with support from the Blue Mountains City Council. The military-surplus MB was already fairly ancient when the Brigade obtained it in February 1967 to serve as a personnel carrier and to pull a tank trailer with gas-driven pump, as Blaxland's second attack unit. 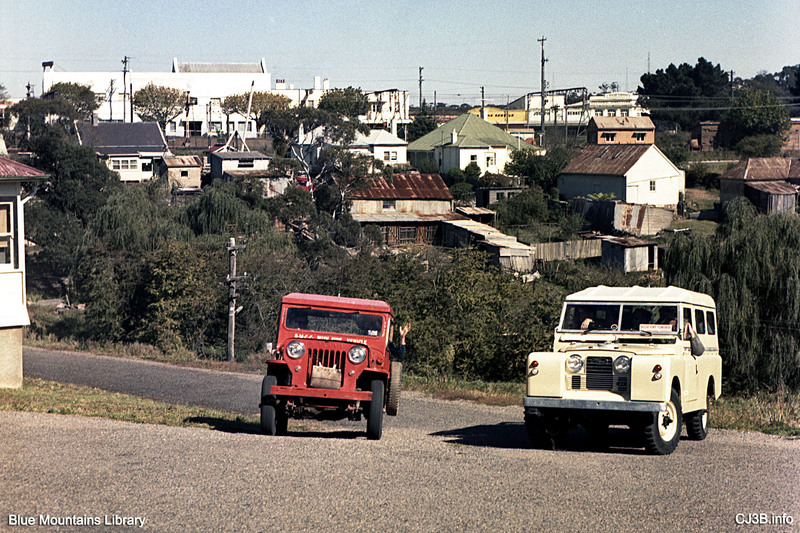 The jeep was replaced only two years later by a short wheelbase ex-army Land Rover. This photo was taken at the 2017 Sydney Classic & Antique Truck Show, held at the Museum of Fire, Penrith. 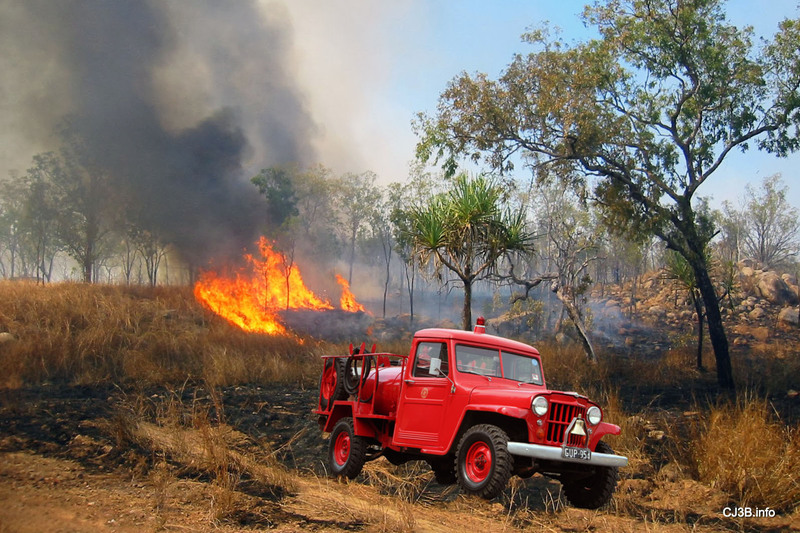 The Country Fire Authority in the state of Victoria was formed in 1945 to manage bushfire suppression across the state, and now comprises over 1,200 fire brigades. From 1956 until 1984 the CFA employed a number of unique Willys tanker trucks in the protection of lives and property across Victoria. This composite photo created for CJ3B.info shows one of the CFA's Willys tankers as it might have looked in 1957. This particular truck is now on permanent loan from the CFA to the Fire Services Museum in East Melbourne. It's actually on the CFA reserve list and can be called back into service. 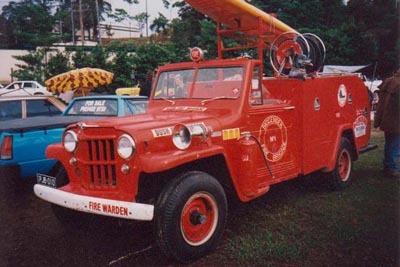 Keith Pakenham of the CFA told CJ3B.info in 2013, "15 Hurricane Willys tankers were produced for the CFA in 1956, with a BSA pump and a 180-gallon water tank. In 1965, 15 Tornado 17B Willys tankers were produced with a newer BSA pump and a 200-gallon water tank. These small 4WD tankers enabled crews to get in ahead of larger tankers to wildfires and knock the fire down quickly." Another composite picture created for CJ3B.info shows a 1955 Willys L6 truck owned by John Keane. 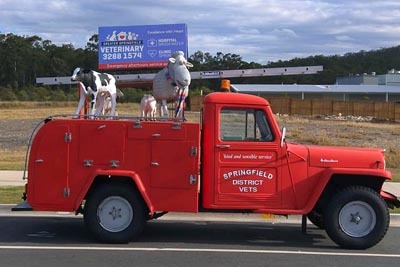 Formerly with the CFA Brigade in Ballarat, Victoria, this truck was purchased by John in 1977, with only 13,000 miles on the clock. 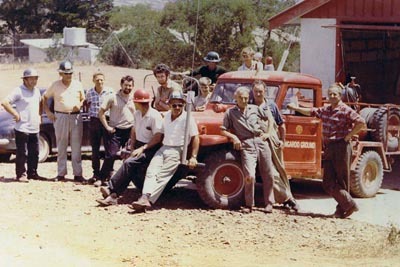 This photo from Keith Pakenham shows a radio-equipped tanker with the volunteers at the original CFA Kangaroo Ground fire station, northeast of Melbourne. 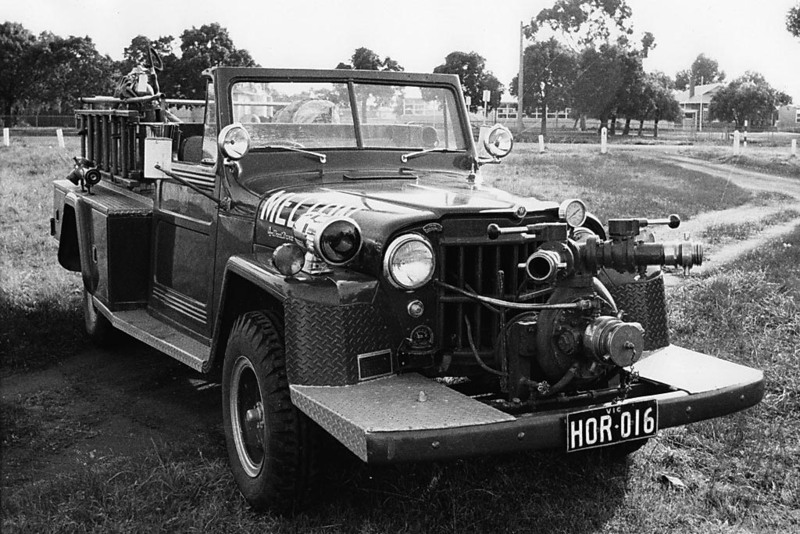 This example of the distinctive and practical Willys fire truck design is proudly lettered for the village of Yellingbo, which Mike Kelly tells us is about 30 miles east of Melbourne. See also another Yellingbo unit (70K JPEG) pulling a pump trailer. The photos were found by Wayne Ellard. A postcard, No. 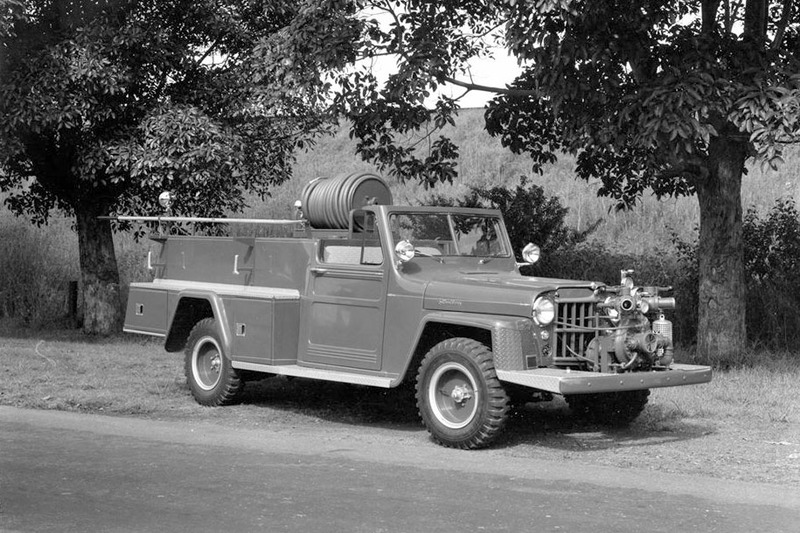 2 in a series of "Historic Fire Fighting Vehicles" from the CFA, shows their "Willys Jeep Type 14 Tanker." Thanks to Ross Brealey. A 1973 brochure produced by the CFA includes photos of Jeep trucks in the 1960s. 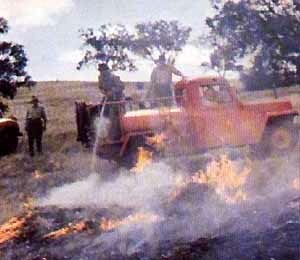 The brochure describes the dramatic and successful battle against bushfires by volunteer fire fighters. Photos include a Willys truck in action and a Willys truck and a larger tanker in the grasslands. Thanks to Ted Robinette. 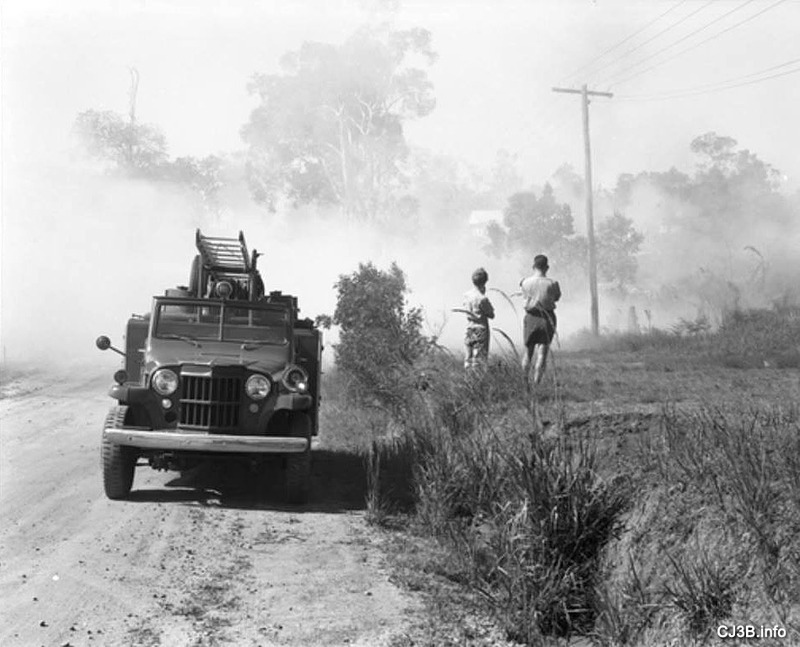 See also a photo showing the mobilization of resources to fight a fire in Benalla in 1968 (15K JPEGs). 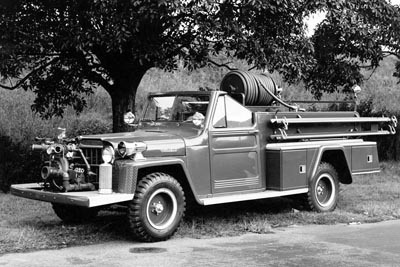 See also Jeep Gladiator Fire Trucks for a few Gladiator tankers built for the CFA starting in 1966. This photo of a Willys Commando brought to Australia was also supplied by Keith Packenham, who says: "CFA only had one front-mounted pumper and it was fully imported from America. 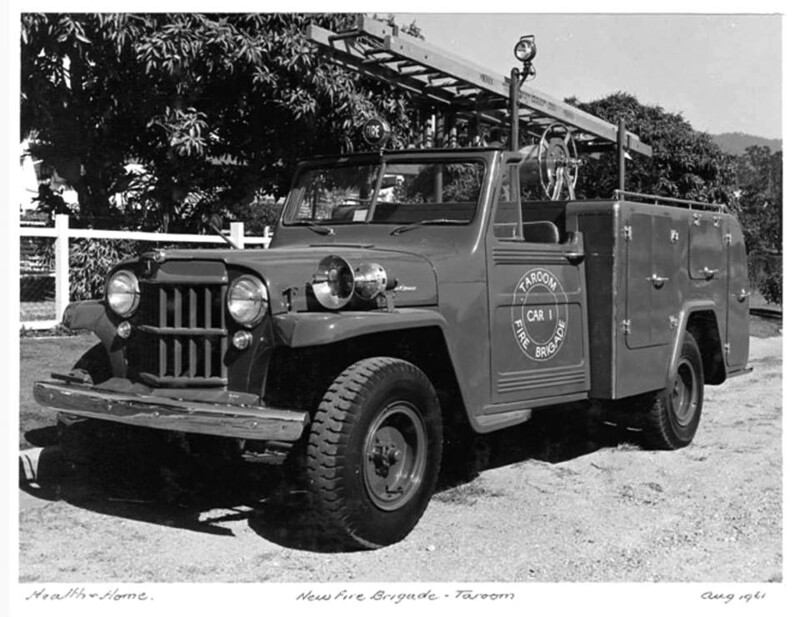 It was a 1962 Hurricane which was used at Monbulk fire brigade in the Dandenong Ranges until 1970 when it was transferred to Melton fire brigade to be used for another three years. It was then sold in 1973." 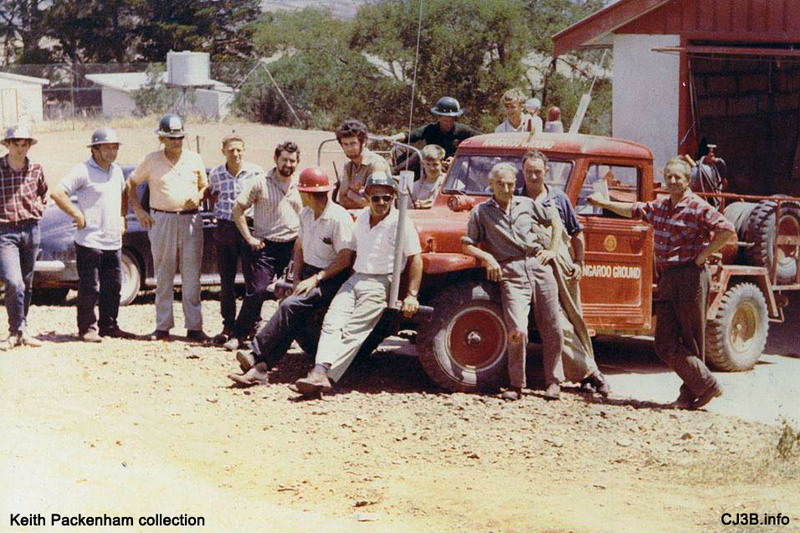 An Australian factory photo suggests that the CFA example above (with its siren on the right fender) was not the only Commando imported. See also a right side view (190K JPEG). Photos taken by Brian Chirlian & Co. Commercial Photographers in Sydney, courtesy Vaughn Becker. 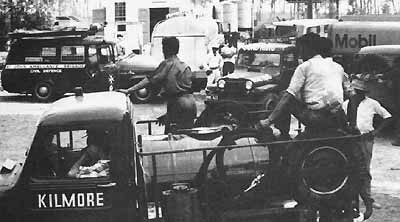 Wayne Ellard found this picture but doesn't have any information on the truck shown -- anybody know where this was taken? See also a side view (30K JPEG). 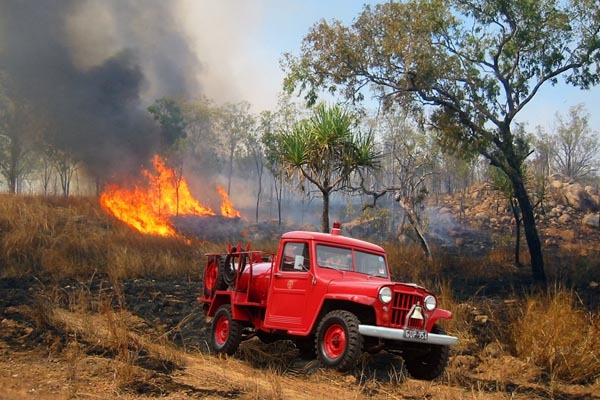 Rural Fire Service Queensland is the volunteer arm of Queensland Fire and Emergency Services, originally established as the Queensland Fire Service in 1990. RFSQ has some 35,000 volunteers in 1500 brigades, covering 93% of the state. 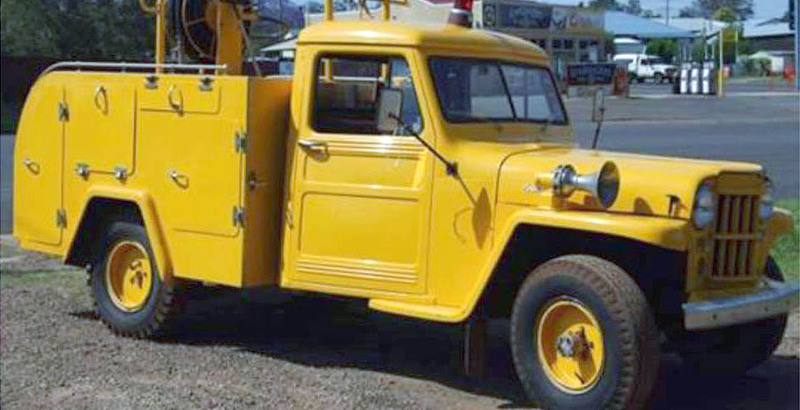 From the front, this open-cab Queensland pumper looks similar to the U.S.-built Willys Commando (100K JPEG), but without the front-mounted pump. Thanks to Mick Broomfield and Willys Australia for the undated photo, taken in Tewantin, on the Sunshine Coast north of Brisbane. 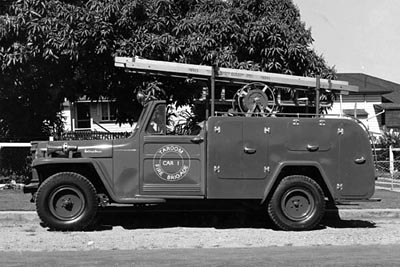 The design of these Queensland pumpers actually owes little to the Commando, other than the cab, chassis and 6-226 engine. Like the Swedish Hose Car, it's a piece of apparatus built on a Willys chassis, but designed for local needs and standards. This example is still in the small cattle town of Muttaburra in central Queensland. 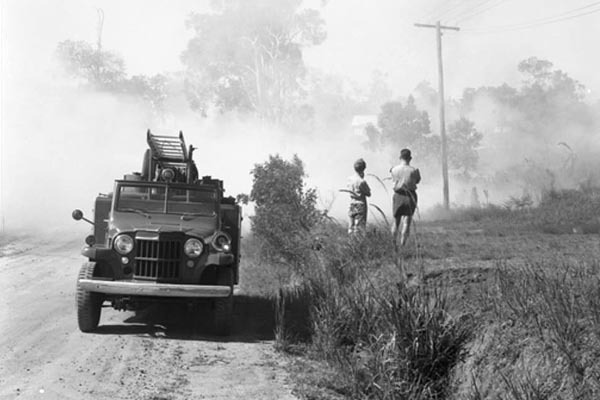 Vaughn Becker, who sent the photo, provided this background on the truck: "The Queensland Government supplied a number of these units to small rural towns about 1961. 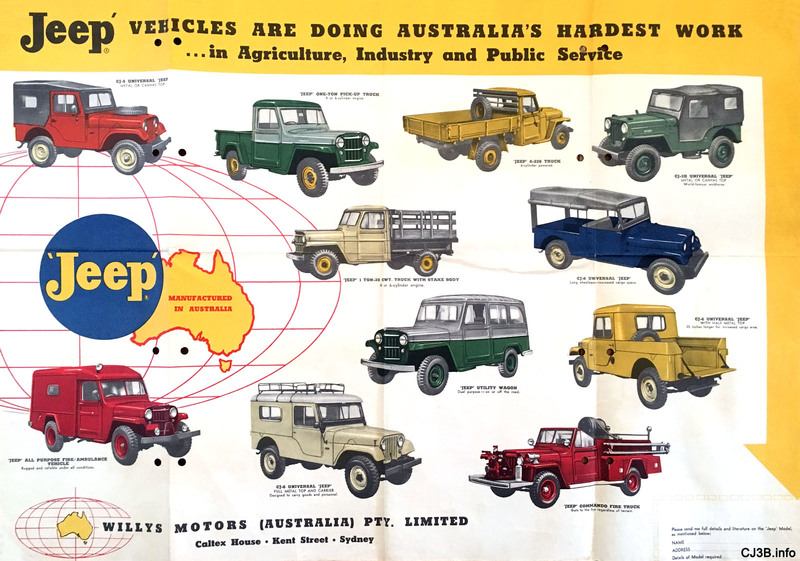 The trucks left the Willys Brisbane factory as cab/chassis and were converted in Brisbane prior to being put into service throughout the state." 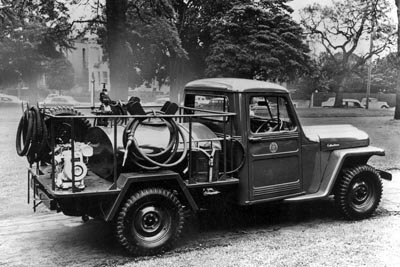 The rear-mounted pump, central stowage for the hard suction hose, and overhead ladder rack, result in a body with very clean lines, and storage compartments for lots of gear. The trucks reportedly had an 88-gallon tank and carried 800 feet of 2-1/2" hose. 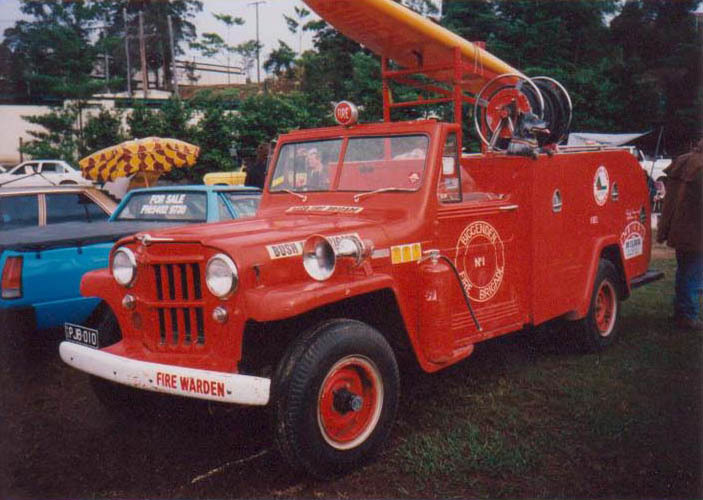 This Queensland pumper survived in Biggenden, a thousand kilometers east of Muttabura, as of 1997. Biggenden is a mining and agricultural town north of Brisbane. Photo by Graham Kircher. 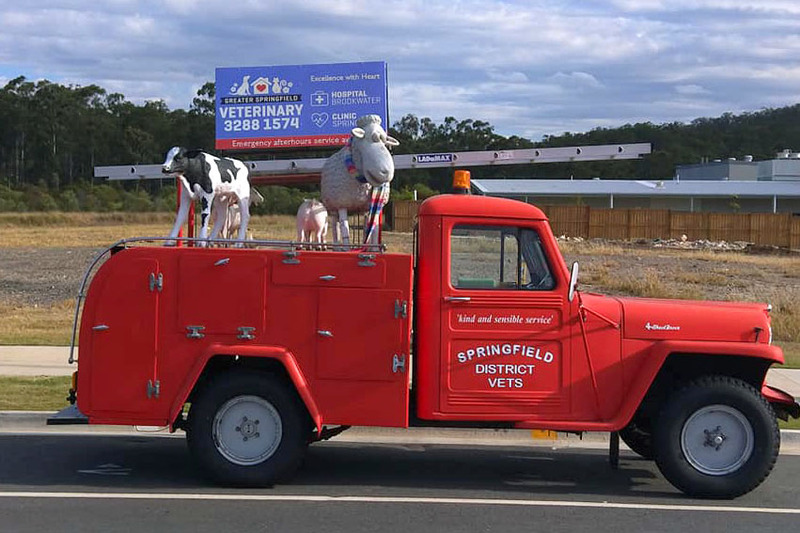 An example with some minor differences including a closed cab, has been restored and is used to promote a veterinary practice in Springfield, on the outskirts of Brisbane. Another closed cab survivor was advertised for sale in 2017, painted in yellow (90K JPEG). 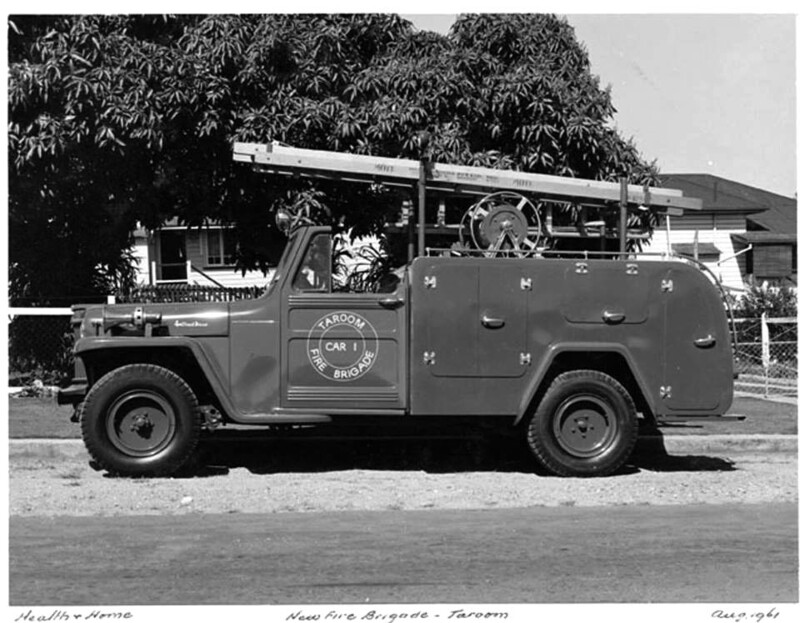 This one, seen in what appears to be a factory or delivery photo, was the first piece of apparatus for the new fire brigade at Taroom in 1961. See also a front view photo (100K JPEG). Photos courtesy of Mick Broomfield. 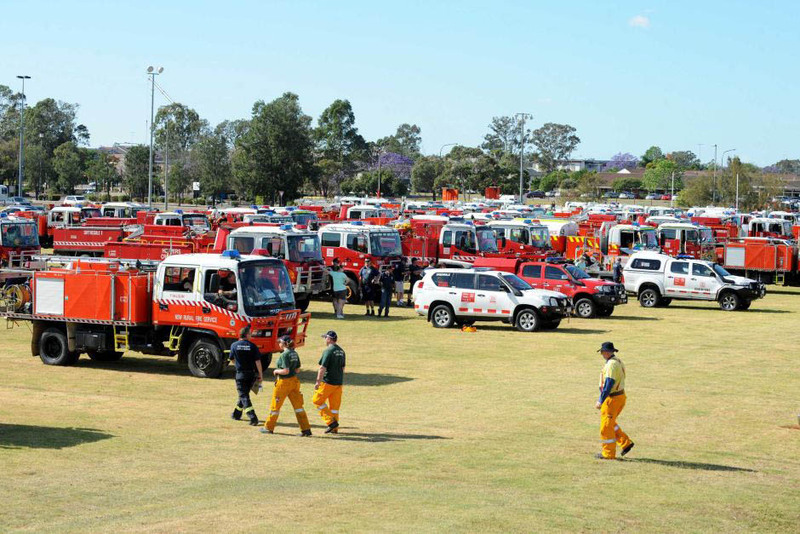 See an FC-170 of the Sutherland Bushfire Service, and the Presha FC-170 Light Rescue Tender, in Jeep FC Fire Engines Around the World. See more Jeeps in Australia.